Cheques and Cash received as a result of the Service at St. Bartholomew's Church. 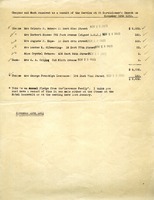 This document shows cheques and cash that was received at St. Bartholomew's church. 5 cheques were received and the other was cash. Note that this is an annual pledged made from the "Lawrence Family.